Born on 7th November 1980, Karthik started his professional singing career as a backing vocalist and has since been working as a playback singer. Karthik developed an interest in music, early in his life. He is a trained Carnatic music vocalist and has been training since his school days. An ardent fan of A. R. Rahman, Karthik's dream was to meet Rahman and sing for him. After a worthy wait , he got the opportunity to meet Rahman through playback singer Srinivas and was asked to sing the song "Nendhukittaen" from the film Star. A versatile Indian singer who has over 2000 songs to his credit & sought-after voice by renowned music directors like A.R.Rahman, Maestro Ilayaraja, Vidyasagar, Harris Jayaraj, Karthik Raja, Yuvan Shankar Raja, Pritam and others. He has a pan-Indian appeal with chart-busters in several languages like Tamil, Hindi, Telugu, Malayalam, Kannada, Bengali & English. He has trained for years across diverse styles, from Carnatic to Hindustani, from fusion to rock, from filmi numbers to pop. He has to his credit scores of awards that stand testimony to his talent, including IITA, Filmfare and State Government awards. "Ennaku Oru Girlfriend" from the Tamil film Boys was one of the biggest hits of the year as was "Oru Maalai" (Ghajini; 2005). His songs for Telugu films for Kotha Bangaru Lokam (Nijanga Nenanaa), Happy Days (Arare Arare, Oh My Friend), "Badhulu Tochanai" (Mr.Perfect), "Manase Guvvai" (Naa Peru Shiva), "Oh Oh My Friend" (Oh My Friend), "Meghama" (Journey) are very popular. His other popular songs include "Ava Enna" from the Vaaranam Aayiram (2009), the title track from Unnale Unnale, "Behka" from Ghajini and "Alle Alle" from the Kannada film Savaari. In 2010, he sang a track "Behene De", from Hindi film Raavan, which is widely considered as the biggest song in his career. The track, which topped music charts for many continuous weeks, also received rave critical reviews. Karthik also performed the Tamil and Telugu versions of the same song titled "Usure Poghudhey" and "Usire Poyene" respectively. He has composed music for a multi lingual Coca Cola Advertisement (for Rajeev Menon featuring actor Vijay) and Prince Jewellery advertisements. In the year 2011, Karhtik performed at the Jazzaar Festival, a not for profit organization that was formed in 1997 in response to the Bands Across the Seas (BATS) programmes directed by Fritz Renold. He performed with Fritz Renold (Composer & Arranger), Steve Prosser (Vocalist), Ravichandra Kulur (Flute), Dr.Mysore Manjunath (Violin), Lew Soloff (Trumpet), Chico Freeman (Saxes), Christian Jacob (Keyboard), Kai Eckhardt (Electric Bass), PAndit Aninido Chatterjee (Tabla), Giridhar Udupa (Ghatam) & Willy Kotoun (Percussion). JAZZAAR gave him the inspiration to pursue his interest in Indian classical music. Experimenting with talented musicians, Karthik’s passion grew with every successful performance, and classical fusion has become his forte. Karthik has also released an album called "Music I Like". It is based on carnatic ragaas and it is a contemporary take on some well known keerthanas. The orchestration was done by Mr. Sai Madhukar. The album’s USP was that it reached young and experienced music listeners alike and has topped various charts for months in a row. 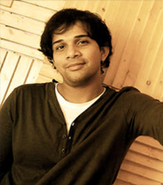 His first film as a music composer was the critically acclaimed Tamil film 'ARAVAAN'. He has recently composed for a Telugu movie named 'Okkadine'.